Before the parchment scrolls, and before the printing press, people communicated through stories—an oral tradition. Elders would tell tales to the young about their own pasts—as well as repeat the tales that their elders told them. Today, despite all the paper, publications, and government documents that are generated, there is still a place for people telling their stories, so that we can form a better understanding of the past. SMU has been involved in gathering and making oral histories since the 1960s—both formally and informally. Hastings Harrison, who came out of retirement, to become a fundraiser for Southern Methodist University in 1959, created many hours of oral history. Alas, those 15 reel-to-reel tapes with his memories have never been transcribed. 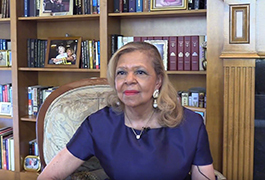 As a part of SMU’s 75th anniversary, the SMU Woman’s Club interviewed 49 SMU alumni, faculty, and staff from 1983-1988. Those tapes and some transcripts are available in the DeGolyer library. 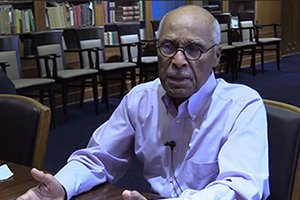 History Professor Ron Davis was a prolific oral historian interviewing more than 475 people. His interviews focused on the vaudeville and show business community. The bound transcripts are available from the DeGolyer Library. 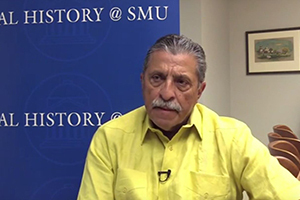 The SMU Video Archive Series contains videotaped oral histories with leading administrators, faculty, staff, and others with significant ties to the University, whose careers spanned many decades at SMU. The series was created by Central University Libraries and began in 2000 to capture the extensive knowledge base of SMU retirees. The 72 interviews were created between 2000 and 2005. The Southern Methodist University Oral History and Digital Humanities Student Projects collection features oral histories conducted by students on either Dallas or Southern Methodist University topics of interest. The classes are taught by Assistant Professor Jill Kelly, of the William P. Clements Department of History. Classes are limited to fewer than 20 students, and they are taught the ethical, theoretical and practical sides of oral history. The difference between this current oral history programs and past oral history programs is digital. Students do the interviews using digital video. The transcripts/highlights of the interview are done online using digital technologies, instead of listening to tape and typing each word—as was done with the past. The videos are shared to the world on a digital platform. There were only two old-fashioned parts to this project: 1) researching in the Bridwell and DeGolyer Libraries, and 2) Interviewing people face-to-face. The Voices of SMU Oral History Project is a collaboration between students, alumni, and entities across campus. 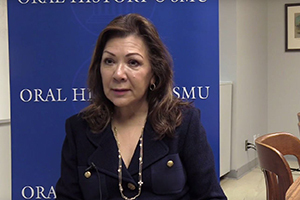 When Dr. Jill Kelly approached SMU Archives about preserving oral history interviews for her Doing Oral History classes, Joan Gosnell recommended that we use the class to address serious gaps in the university archives. More generally, the SMU Archives tend to represent faculty and staff better than students. When it comes to documenting students, this often means documenting the majority. 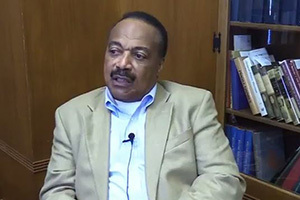 Tim Binkley of Bridwell Library Archives had already begun a campaign to demonstrate that the archives care about receiving and promoting the scholarly use of papers of African American church leaders. 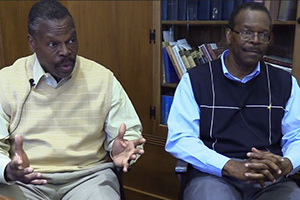 His efforts and 2018 exhibit “Three African American Bishops” suggested a need to document the experiences of black students at SMU. Individuals across campus and alumni helped students identify participants, including some of the first students to integrate SMU as well as more recent graduates. Since the Spring 2018 class, several student researchers, supported by Summer and Undergraduate Research Assistantships, have continued interviews and expanded the project to document the experience of Latinx alumni. Additional interviews not made public may be available upon request. Please contact the SMU Archives for more information. 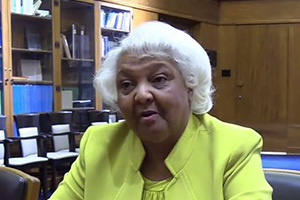 Please find other materials related to African American History at https://bridwellguides.smu.edu/AfricanAmericanSMU. In 2011, Aaron Sánchez, Ruben Arellano, and Nyddia Hannah researched and wrote The Latina and Latino History of Southern Methodist University documenting the “history, scholarship, and accomplishments of Latina and Latino students, professors, and student groups at SMU from the 1910s-2000s.” It is available in SMU Scholar. We would like to document your experiences! If you are an alumni and would like to participate in an interview for the project, please fill out this form and our student researchers will get in touch with you. If you have questions, please contact us at oralhistory@smu.edu. Oral sources have maintained a central position within programs of recovering the African past. They serve as the clearest signature of and for the African historiography. But teaching African history in Dallas, Texas does not always enable students to engage in the creation and production of oral sources on the African past. The international movement against apartheid offers one exception to this. The quest to end apartheid in South Africa involved efforts of activists within South Africa, the diplomacy of the African National Congress in exile, the sabotage and military actions of Mkhonto weSizwe, and an international network of activists who launched boycotts of South African sports, musicians, and goods and organized divestment campaigns in their communities, schools, and workplaces. Working with the African Activist Archive and in local archives, students in Dr. Jill Kelly’s upper-level course Oral Sources in African History identified people at SMU and across North Texas who sought to end apartheid by isolating it internationally with sanctions and divestment. Listen to the oral histories from the Spring 2017 class. SMU History Department faculty members are dedicated teachers and distinguished scholars, specializing in fields ranging from North America, Latin America, Europe, and the non-Western world, who are committed to the pursuit of knowledge and the education of their students. They believe that the study of the past offers students critical and analytic skills essential not only to the discipline of history but also to their students’ future careers. The recordings in this collection are protected by copyright. No reproduction or distribution is permitted without the written permission of SMU Archives, Southern Methodist University. For some materials, only the item's metadata will be available and the digitized item will be available on a restricted access basis. Such items may only be viewed on campus. When items are available for use, please cite SMU Archives, Southern Methodist University. For more information, contact degolyer@smu.edu.